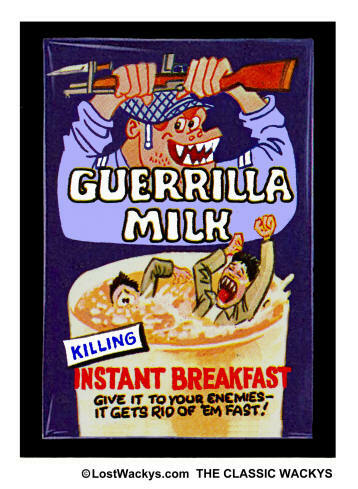 Guerrilla Milk never got to be a sticker, but if it had, maybe it would have looked like this. 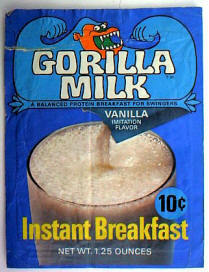 Twenty five of the 1973 2nd Series stickers were based on the 1969 Wacky Ads, but Guerrilla Milk didn't make the cut. Pillsbury, the maker of Gorilla Milk, didn't send any letters until 1974, so this wacky was probably dropped due to its Vietnam War theme. War protests were at their peak in 1969 during the Wacky Ads debut (see Commie Cleanser ), but by 1973 it was old news to the typical American kid.